Several wildfires were sparked by dry, windy, and unseasonably warm weather on January 31st in Oklahoma and Kansas.Â The National Weather Service office out of Norman Oklahoma had posted a Red Flag Warning, advising the public of the extreme fire danger earlier in the day.Â But that wasn’t enough to prevent all fires from breaking out. 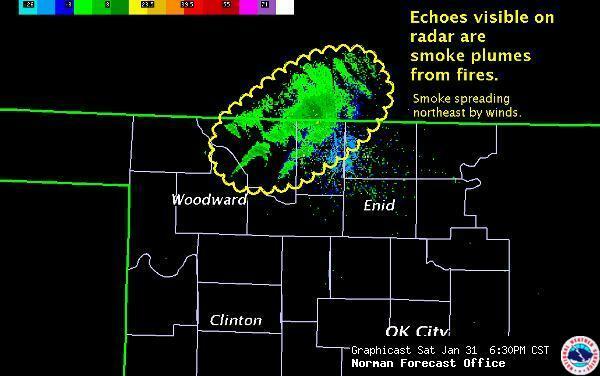 Several large grassland fires burned along the central Kansas/Oklahoma border.Â Strong winds from the southwest helped fan the flames, blowing miles-long plumes of smoke to relatively high altitudes.Â As the fires burned, the doppler radar stationed in Norman, Oklahoma was actually able to detect the smoke plumes as they drifted to the northeast. One massive grass fire covered 16 square miles and burned throughout the afternoon and early evening near Crescent in Logan County. Five wildfires also burned in Woodward and Harper counties. Woodward Fire Chief Steve Day says the largest blaze, near Selman, charred approximately 12,000 acres. UPDATE 04/10/09:Â The April Wildfires were also detected by meteorology technology:Â See how the larger April fires were visible from space.